This contest is over please join the current one. The daily give-a-way winner will be selected at random from people that comment on this post. And I'll announce the winner the following day on the next day's contest post. I'll pull the list of entries from the comments approximately 24 hours after the post depending on my schedule. So unless you see the following day's post go ahead and add a comment. I'll will include entries right up to the last minute before I post the result and next contest. Disclaimer: I will do my very best to have a contest each day. However, I could without notice take a day or two off. On days that I'm off there may not be a contest so please try and be understanding if there is a couple of days without a contest. To keep this simple and workable there will only be one rule. I don't want to disqualify new people or people that forget to resteem, upvote, and follow. I'm very appreciative of the upvotes and followers that participate in my contests. Please follow me so you can see the results of the contests. 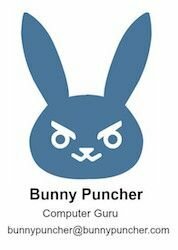 BunnyPuncher Don’t worry your bunnies are “fairly” safe! Story of an honest Steemian. Honesty in today's world it still exists!! Good to see you here @giddyupngo. And as always thank you so much Mr. @bunnypuncher. For this, and for everything you do! Thank you very much for the gift ,, I did not expect to outperform many people because there are hundreds of people there,,but I'm can the gift it.. This is the first time that I am participating your contest.You are doing a great job sir.Thats why we love steemit most,and persons like you are the reason behind for this love.I salute you sir.Upvoted and resteemed also. You are welcome here @nahid05. Well, sounds good.Thanks for your complement. I like your contest everyday..
One day I'll strike gold. Thanks for keeping this community positive and reciprocal!! I want to win, but I do not know when that happens .. The coolest of cool contest running continously on steemit!!! Approaching Lebaran, I hope to get a little souvenir from you ..
Hope all people success in this contest. Thanks @bunnypuncher for this initiative! Yes I do! Joined yesterday but thanks for reminding me today brother :) Hope we win! i am participating your contest 5th time.great job. Am i going to win this season? Keep trying: D Congratulations to the winners! is it possible for winners to win again or new ones get selected every day? Winners can win again. There is no cool down on winning. Omg I've been gone for so long, good thing the very first post I saw is your contest post! Haha, btw I love all your contests and thank you for your hard work!! Good luck to everyone! Congratulations to the winners. Thanks @bunnypuncher for another opportunity to be in the contest. Another contest equals another comment. Hoping that I would be the Lucky one today.... Thank you in advance @bunnypuncher! Yey!! Hoping to win this time! I believe there is always a first time. I am back again, dauntless. Thank you for this kind of initiative @bunnypuncher. Have a heart! Upvote this post! Thank you @bunnypuncher. I would love to win this one day. It's hard to win it again because the more participants ..
Congratulations to the winners! And thank you @bunnypuncher for this giveaway! Still hoping to be the lucky one. My luck will be here anytime soon. I'm thankful and excited that maybe tomorrow will be my lucjy day again. Spread the Good Vibes. Even the Best Falls down sometimes. Around of applause to this humble guy @bunnypuncher. Thankd for making this contest that everyone will surely love. Wait right where you are....there is a bunny in the yard just asking to be punched. I'll be back. Hi, I'm back. It had seemed to me that I was not lucky, I decided to try again dear friend! Yes, I actually won this time, thanks to Bunnypuncher. I will not participate for a few days, can't be wanting to win every time. Yes you are in with that comment. Congrats for being a winner today. WOW, congrats, and i'm here again to participate. Looking forward to your next contest to be handle hihi 😊 great post 😊 Godbless! I have not been bored with your daily contest yet ..
Good luck everybody. Thanks @bunnypuncher! arif,arif, keep hoping, keep hoping! Still waiting to be picked for the first time. hope you will be alive on that day when you will be picked!